I compiled this bibliographic resource for use by educators, particularly middle grade teachers and school librarians, who wish to present students with an instructional unit on the historical aspects of the Titanic sinking of 1912. The materials selected for this bibliography are suitable for middle grade students (grades 3-6). However, certain materials listed are also acceptable for students as young as the second grade, including the picture books Polar the Titanic Bear and Titanicat. I opted to include these picture books to accommodate younger readers or readers with low reading comprehension skills. In compiling these resources, I visited several branches of the Austin Public Library to peruse their collections of juvenile materials relating to the Titanic. I also consulted the School Library Journal, which offers reviews of several seminal children’s works about the Titanic sinking. Ultimately, I selected five books which provide insight into varying aspects of the Titanic’s history. A school librarian could use these five books to create a Titanic display for students at a variety of reading levels who are interested in learning more about the Titanic, whetherfor a report, for pleasure, or for both. Furthermore, I also utilized the internet to locate websites and videos which usefully underpin the books I selected. The “ALSC’s Great Websites for Kids” list provided me with one particularly useful website on the Titanic called “Titanic Destination…Cyberspace.” I also discovered that reputable websites like the History Channel website and the Discovery Channel website have digital content suitable for middle grade students and younger. Having personally visited several Titanic exhibits, I was also aware of several great community resources available for students in the state of Texas. I also chose to include potential field trips, realia, and games in this bibliography because of the value of immersive, experiential learning. Brewster, Hugh. Illustrated by Ken Marschall. Inside the Titanic (A Giant Cutaway Book). Little, Brown & Company, 1997. Illustrated by one of the foremost Titanic authorities, this book realistically depicts the experiences of two children who sailed aboard the Titanic in 1912. Impressively sized and richly illustrated, this book will immerse even very young readers in the Titanic’s fateful maiden voyage. The “cutaway” nature of the book’s illustrations allows readers to “explore” the Titanic in a literal way. Readers can view the interior of each deck in vivid detail, from the first-class cabins to the steerage compartments. When presenting a unit on the Titanic, this resource will attract reluctant readers who are turned off by text-heavy books. Crisp, Marty. Titanticat. Illustrated by Robert Papp. Sleeping Bear Press, 2011. Jim Mulholland is a cabin boy aboard the Titanic. As the ship prepares for its maiden voyage, Jim is tasked with taking care of the ship’s cat, whom he dubs 401. What follows is a fictionalized version of true events, providing a lighthearted perspective on a usually somber subject. Young readers will delight in this beautifully-illustrated picture book and the whimsical, slightly mysterious story it tells. Rendered in oil on canvas, the cover of this book will add visual appeal to any displays created about the Titanic. Kentley, Eric. Illustrated by Steven Noon. Story of the Titanic. DK, 2012. This bibliography is intended as a tool for public librarians seeking to grow their collection of women’s history resources for middle grade and early teen patrons. This bibliography puts particular attention on fields where men are typically celebrated and women overlooked: those of science, civil rights, combat, and aviation. In building this bibliography, I consulted resources such as the Odyssey Audio Book Award and ALSC’s Great Websites for Kids list. However, I had trouble finding items that would adhere to this bibliography’s project on mainstream media awards lists, so I also sought out suggestions by book bloggers and considered GoodReads reviews in the course of making my suggestions. Discovering American Women’s History Online. http://digital.mtsu.edu/cdm/landingpage/collection/women. Website. This history site allows students to browse its collection of articles and links by subject, state, time period, and primary source type. Though the website’s interface is a bit dated, the information is still solid–it just needs a facelift. The site is an index of women’s history resources and archives throughout the web, and most searches compile a list of links that will lead to sites hosted by other libraries and universities. This resource would be most helpful for a middle or high-schooler undertaking an in-depth research project, whether for school or because of personal interest. Because of the site’s clunky interface, the student may require help navigating its bountiful resources. Distinguished Women of Past and Present. http://www.distinguishedwomen.com/. Website. At this website, again, an outdated interfaces hides a wealth of valuable information and resources. Visitors can browse by subject or search for women’s profiles by name. The subject list is long, and the amount of women included is impressive. The profile for each woman is short, but it includes important links to other resources on the web, making this site a good starting point for students undertaking research projects. The interface at this site is slightly more user-friendly than ‘Discovering American Women’s History Online,’ making this a good site for middle- to high-school-aged patrons to navigate on their own. The Library of Congress, American Memory: Women’s History. http://memory.loc.gov/ammem/browse/ListSome.php?category=Women’s%20History. Website. There are seven collections grouped under “Women’s History” in the Library of Congress website, and this site includes portals to four different collections related to the suffrage movement, a collection of broadsides and ephemera, a collection of manuscripts, and a general multi-format women’s history collection. This general multi-format collection is a good gateway for young researchers, although children may require assistance in navigating the somewhat-confusing Library of Congress Interface. Once that is conquered, however, there is a wealth of primary source material here, and for young users especially the photographic archives will be especially fascinating, since they offer a peek into a very different time in America’s history. Women in World History. http://www.womeninworldhistory.com/. Website. This site for teachers and students provides a good starting point for research as well as a great resource for teachers searching for curriculum guides for women’s history lessons. The site offers thematic units built around such concepts as “Women of Courage” and “Women’s Ways to Connect Across Cultural Borders.” The site also includes biographies of female heroes and rulers, ranging from Shagrat Al-Durr to Anna Comnena. This is another site that could benefit from a digital update, but the information housed here is still sound and valuable. Krull, Kathleen. Lives of Extraordinary Women. Audio Bookshelf, 2001. Audiobook on CD. 2hr. While many children’s fiction books feature philanthropy as a theme, non-fiction materials are more difficult to find. Much of the non-fiction focuses on the environment, so this bibliography should help teachers and caregivers develop a more well-rounded selection when teaching about philanthropy. These items are suitable for a range of ages, from 3 to 12, as noted below. I used library catalogs, WorldCat.org, audible.com, and A to Zoo by Caroline Lima to find these items. Bee Kind. Available from the Apple App Store. Free version. A cartoon bumblebee teaches you to be kind to yourself and to others. Spin a wheel to generate ideas for good deeds. This creates an interactive To Do List that allows you to check off tasks and add your own. This is a very simple app that has a bright kid-friendly interface. Some tasks may be better suited for parents like “Give money to a charity,” but it works well overall for ages 6 and up. Dr. Duncan Dog on Duty. By Lisa Dunn-Dern. Illustrated by Andrea Yomtub. E-book app available from the Apple App Store. $0.99. With charming watercolor illustrations, this interactive e-book demonstrates the power of service. The little girl tells us that even the family pet has a job to do: he is a therapy dog. Readers are introduced to the idea that everyone has talents to share, and one important talent of dogs is their therapeutic presence. Features include read-to-me audio narrated by the pleasant voice of a young girl, auto play, and personalization of narration. The Berenstain Bears Hurry to Help. Oceanhouse Media. Available from the Apple App Store. $3.99. The Bear Scouts are earning their Good Deeds Merit Badge in this interactive e-book featuring Christian-oriented themes of philanthropy. The app features professional narration, background audio, and enlarged illustrations. Read to me, read it myself, and auto play. Doing Good Deeds. Available from the Apple App Store. Written by Umm Ilhaam. $1.99. Part of Darul Kitab’s Learn About Islam Series, this e-book app for the iPad introduces young children to a variety of good deeds that are in accordance with the Qur’an and Sunnah. Engaging narration accompanies beautiful illustrations. Mitzvah Hunt. Available from the Apple App Store. Free. This game app for the iPad features Jewish-oriented philanthropic lessons. Learn to observe the good rather than the bad by tracking the good deeds of others. Mr. Owl sends his class out into the community to learn first hand, the benefits of volunteer work. By day’s end, Franklin has found jobs for everyone except himself and feels he hasn’t accomplished his goal. Based on a true story, Two Bobbies takes place in the aftermath of Hurricane Katrina when many pets were lost or abandoned. A dog and cat wander together through the devastated city and miraculously survive hunger, floods and other dangers. When they are finally taken to an animal shelter, the volunteers discover that the cat is blind and could not have survived without the dog’s help. Although their owner or owners are never found, the two friends, re-named Bob Cat and Bobbi, find a new home and a happy ending to their ordeal. The story includes an authors’ note and a photograph of the real Bob Cat and Bobbi. Includes a conversation with the authors. Author: Noon E. Productions. ; Clearvue & SVE, Inc. Publisher: [United States] : Clearvue & SVE, , ©2003. Series: Government & citizenship collection. Illustrates the ways we all can make differences in others’ lives and in our country, and stresses the importance of participating, volunteering, and leading. Winnie the Pooh: Helping Others. 1988. VHS Video. Also available in four parts on YouTube. This collection of print and non-print materials is meant to introduce children to the Mexican celebration known as the Day of the Dead. Also known as Día de los Muertos, this celebration takes place on November 1st and November 2nd, in connection with the Catholic holidays of All Saints’ Day and All Souls’ Day. This holiday can be traced back all the way to the Aztecs and is now celebrated all over the world and in many cultures. The Day of the Dead is a time for families to gather and celebrate their loved ones who have died. Mexican culture has a different view on death and chooses to celebrate it. During this celebration, families will visit the gravesides of loved ones or build altars in their memory. The dead are honored with their favorite foods and other offerings. These materials are meant for use in the classroom and can be used to expand the holdings of a school library. The intended age group for these materials is for children between the ages of 8 and 10. 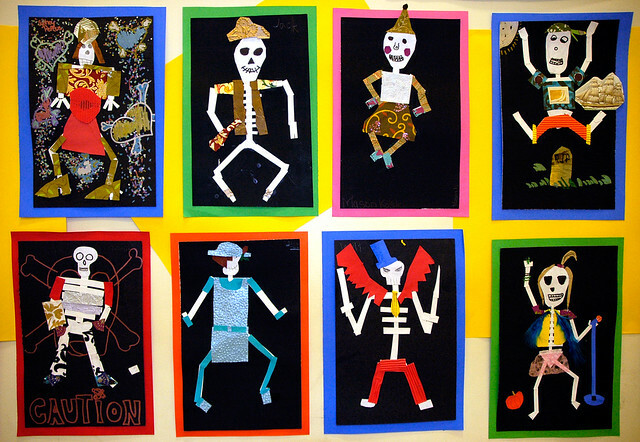 These resources are intended to introduce children to Mexican folk culture and the Day of the Dead. Children who have had limited exposure to the Day of the Dead will learn the history of the holiday. Children will also learn how people celebrate the Day of the Dead and the activities here will give children the chance to take part in the festivities themselves. I have compiled resources from several different mediums — books, videos, PDFs, and DIYs. Several of these resources were found using ALSCs Great Websites for Kids and others were found through educational institutions. * Ancona, George. Pablo Remembers: The Fiesta of the Day of the Dead. New York: Lothrop, Lee & Shepard Books, 1993. Print. * Barragan, Elisa Garcia. “Jose Guadalupe Posada: About This Artist.” MoMA.org. Oxford University Press, 2009. Web. 20 Nov. 2012. Jose Guadalupe Posada was a Mexican artist who died in the early1900s. His illustrations and cartoon work have greatly influenced many Latin American artists and cartoonists. His satirical cartoons were celebrated for their political subject matter. Posada liked to use calacas, or skeletons, to portray his subjects and his work has come to be associated with Day of the Dead. Calacas are often shown laughing or smiling which is meant to remind us not to mourn or fear death too much. MoMA keeps several of Posada’s works in their permanent collection. They can be viewed online along with a short biography of the artist. * “Dia De Los Muertos.” Azcentral. The Arizona Republic, 2009. Web. 20 Nov. 2012. The Arizona Republic is the main news source for Phoenix and surrounding cities. Azcentral, together with Kathy Cano-Murillo, a blogger and crafter of Chicano-pop art, have created a resource to celebrate the Day of the Dead. Some links are area-specific, like events and happenings around Arizona, but other information can be adapted for classrooms anywhere. There are several wonderful craft ideas, such as how to create a matchbook shrine or papercut flowers. There is also a handy glossary of terms in English and Spanish and several education guides for teachers. Also included is a link to a photo album depicting art exhibits, altars, traditional mexican folk dances, and Day of the Dead sculptures. This site can be used to generate craft ideas or to show students how other people have celebrated the holiday. * Pomade, Rita. “Mexican Lithographer Jose Guadalupe Posada: Past and Present.” MexConnext, 2006. Web. 20 Nov. 2012.